The future of our built environment depends on an understanding and appreciation of its contribution to the quality of our lives. We believe every Michigan child and student should have access to the best architecture educational resources available, whether they aspire to be an architect, or just love buildings. Welcome teachers, to the MAF Curriculum Guide for the elementary grades. We invite you to participate in “Architecture: It’s Elementary!” and view a brief video overview of the program here. Supported by local architects, and through a multidisciplinary architectural curriculum approach, with this guide children will gain an appreciation of their built environment and the buildings, towns, and cities that make it up. This online-based guidebook for teachers includes ten lesson plans for each elementary grade level, from kindergarten through grade five. The curriculum introduces children to the study of architecture and the built environment, encompassing art, social studies, language arts, history, science, and math. These lessons engage children’s bodies, minds, and imaginations to explore how buildings and cities are designed and built. Lessons appeal to the various learning styles of children as they look, explore, think and design. In considering how to create functional, safe and appealing environments, children develop observation, reasoning and critical thinking skills. These tools will help students cultivate a lasting appreciation and respect for the built environment. The lessons combine individual and group activities. Within each lesson, Michigan core curriculum standards and the applicable Grade Level Content Expectations (GLCE) are noted, with vocabulary and illustrations provided. References to basic architectural principles are listed. Lessons can be adapted to your school’s needs and interests, and your input and insights are encouraged, as this vital feedback helps to continually refine and improve the curriculum guide. The MAF Education Committee members will support you, answer your questions and provide personal assistance as needed. Click here to explore the full list of committee members, and find contact information in the About the MAF section. MAF, in partnership with Detroit Public Television (DPTV), created Architreks: a program aimed at getting kids excited about architecture, science, and engineering. Each Architreks segment, hosted by a different young architect, explains an idea for a fun activity or science experiment that can be accomplished at home, or in the community, with parents or friends. The first two episodes, shot in Grand Rapids and Detroit, feature prominent buildings and Architreks through typical neighborhoods to find architectural treasures. Enjoy all four Architreks segments below! Rae Dumke, Honorary AIA, was the Executive Director for the American Institute of Architects Michigan and the Michigan Architectural Foundation and on staff for 43 years. In recognition of Rae’s passion, the Michigan Architectural Foundation established and funded this endowment in her name in 2011. 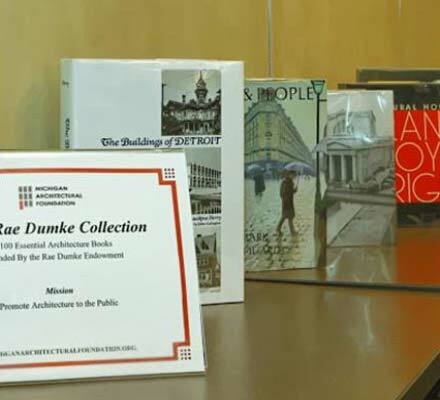 The first project by Rae and her Committee, in partnership with the Baldwin Library, was The Rae Dumke Collection, 100 Essential Architecture Books. Later, the Baldwin Public Library unveiled a second collection of 100 architecture books for children, the Build Imagination Collection. 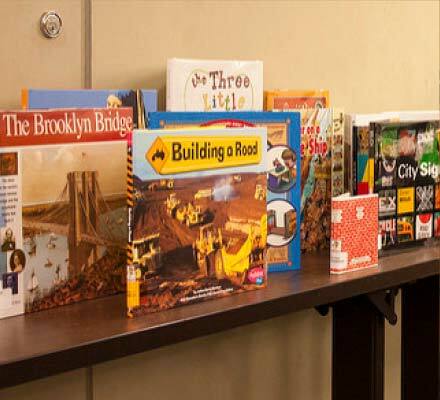 This collection features fiction and non-fiction books on topics that help foster children’s imaginations and raise awareness about architecture.